Bio: In 2005, John Philbin Dolan closed his technology-consulting firm to pursue an art career full time. Already comfortable with pastel, he decided to learn oil painting and in 2007 he attended the Florence Academy of Art in Florence, Italy for their summer program. There he met instructor, Matthew Almy, who taught figure drawing in the summers, but lives in Chicago. When they arrived back in the states, John started his “classical” training under Matt and his wife, Magda. They have since expanded into a 7000 square foot studio space and call themselves The Ravenswood Atelier where John completed his studies in 2011. 2010 was a busy year for John. 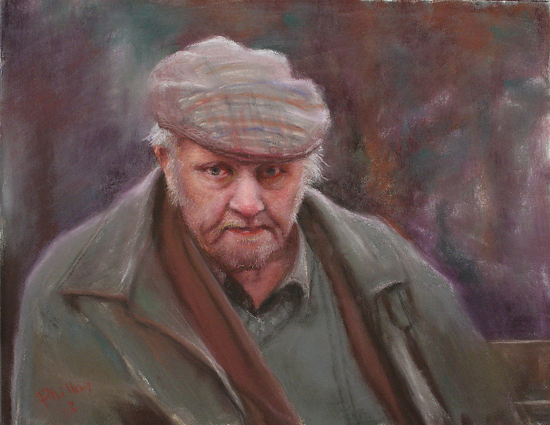 He was made a Signature member of The Pastel Society of America; he was one of 36 artists selected for the International Association of Pastel Societies 16th Juried Exhibition at The Butler Institute of American Art; and one of 60 artists invited to exhibit at the 2010 Pastels by Invitation Show at the Creative Arts Center in Chatham, MA. In 2011, John exhibited in Giverny, France in the Art du Pastel en France's juried show. In 2012, John was one of the few Signature Members of the PSA selected to exhibit at the 40th Anniversary Show at The Noyes Museum of Art in Oceanview, New Jersey. John has also exhibited in a number of shows at the National Arts Club and The Salmagundi Club in New York City. John was the Judge of Awards for the 2012 Richeson 75 Pastel Show. Nitram Charcoal, an artists charcoal, has started using John’s drawing Pericles for their packaging. John has won numerous national awards including The Gold Medal at the 2012 IAPS Gallery Show, and Best of Show at The 2009 Richeson 75 Pastel Show. He is a member of The Oil Painters of America, The Portrait Society of America, Art du Pastel en France, The International Guild of Realism, Allied Artists of America, The Chicago Pastel Painters, The Degas Pastel Society, The American Impressionists Society and is a Artist Member and Treasurer of The Palette and Chisel Academy of Fine Arts in Chicago. UPDATE 5.1.2016: Dolan's work was featured in the Pastel Journal, June 2105, in an article by Natasha Isenhour (qv). Image View: Thumbnails open in an on-page viewer. Size is given. As is normal with FineArtStudioOnline images can be enlarged and download is permitted. The Curmudgeon is 12 x 16 ins. 550 x 425, 312 KB.